Cancer survivors often feel fatigued and have trouble sleeping for months—or even years—after their last chemotherapy or radiation session. Now, a new study shows that yoga can help them sleep better, feel more energized, and cut back on sleeping medications. THURSDAY, MAY 20 (Health.com) — Cancer survivors often feel fatigued and have trouble sleeping for months—or even years—after their last chemotherapy or radiation session. Now, a new study shows that yoga can help them sleep better, feel more energized, and cut back on sleeping medications. “We really wanted to find something useful, because right now there are not a lot of good treatments out there for fatigue,” says the lead author of the study, Karen Mustian, PhD, an assistant professor of radiation oncology at the University of Rochester Medical Center, in Rochester, N.Y. Compared to sleep medication, yoga “can be really empowering,” says Suzanne Danhauer, PhD, a professor of psychosocial oncology at the Wake Forest University School of Medicine, in Winston-Salem, N.C. Sleep medications aren’t always effective and can have side effects, and people who’ve just been through cancer treatment may not want to take any more drugs, adds Danhauer, who studies the benefits of yoga for cancer patients but didn’t participate in the new study. The study included 410 cancer survivors who had completed treatment in the previous two years and had been experiencing sleep problems for at least two months. All but 16 of the patients were women, and 75% were breast cancer survivors. In addition to the standard post-treatment care that everyone received, half of the study participants attended 75-minute yoga sessions twice a week for a month. At the beginning of the study, just under 85% of the participants in both the yoga and control groups were experiencing sleep problems. By the end, 31% of the patients who’d done yoga were sleeping soundly, compared to just 16% of the control group. The yoga participants were also using about 20% less sleep medication, on average, while the people in the control group actually upped their intake of sleep drugs by 5%. Additionally, the yoga participants had substantially lower levels of fatigue and daytime sleepiness compared to the control group. The study, the largest of its kind to date, was funded by the National Cancer Institute (NCI) and will be presented at the American Society of Clinical Oncology’s annual meeting in early June. Danhauer says the findings are good news because yoga that’s appropriate for recovering cancer patients is widely accessible and affordable. “You will probably find someone in your community who has training in Hatha yoga or restorative yoga,” Mustian says. She recommends classes that feature one (or both) of these approaches and an instructor who’s certified by the Yoga Alliance. Ideally, she adds, the instructor will also be experienced in working with patients with health problems. 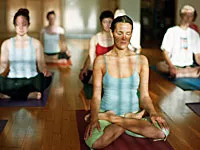 Many of the nation’s top cancer centers, such as the Stanford Cancer Center at Stanford University, the University of Texas MD Anderson Cancer Center, and Memorial Sloan-Kettering Cancer Center, have their own yoga programs. At the Albert Einstein Cancer Center in the Bronx, N.Y., where researchers have been studying yoga in cancer survivors for the past 10 years, patients can continue practicing yoga at the center even if they’re no longer participating in the study. “We have several patients who have been doing it for years,” says Alyson Moadel, PhD, the director of the center’s psychosocial oncology program. Future research will look more closely at how yoga affects the bodies and minds of cancer patients and survivors. Last month, the MD Anderson Cancer Center received an unprecedented $4.5 million grant from the NCI to investigate incorporating yoga into breast cancer treatment. As part of that study, researchers will track the patients’ stress hormone levels and use monitors to measure their wakefulness during sleep.